4-10 % of the German population. The learning disorder affects educational, personal, and social development of children in a negative way. We examine three different approaches to treat learning disorders. That is, therapeutic, computer-based, and digital game-based interventions. We reflect on the advantages and disadvantages of these approaches that have been shown to be supportive for dyslexic primary-school children. Our literature review shows that there is a lack of digital game-based interventions for the treatment of spelling disorders. 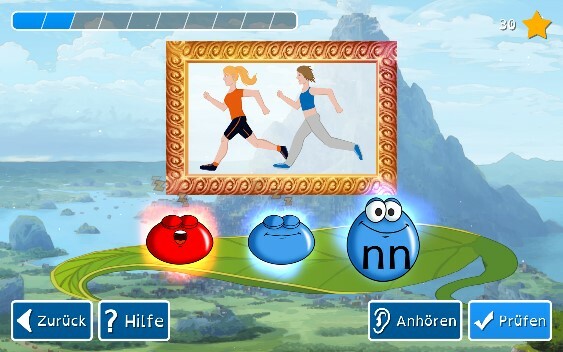 To fill this gap, we propose such a mobile serious game which uses evidence-based trainings and introduces novel features in order to help dyslexic children to improve their reading and spelling performance. We propose an intervention to train awareness of syllable stress and explore the innovative use of mouth motor activities and embodied trainings. To conclude, we suggest that, in addition to traditional approaches, digital-game based approaches should be used supplementary to (re-) engage and motivate learners.